Dubbed as the highest paying and most popular progressive slot machine ever designed – Mega Moolah has ripped up the online real money gaming industry with its 7 figure progressive wins changing the lives of thousands of lucky jackpot winner during its long reign. If you know your slots, then you have probably already guessed that this is a Microgaming hot shot slot with all the nuts and bolts included. It can be played on Android, iOS and Windows laptops, touchpads and Smartphones while sat at home or while on the move. It is a 25 payline slot with 5 reels. The minimum bet is 25 coins and the maximum bet allows 5 coins per line giving you a massive 125 coins maximum spin bet. Wilds, free spins, multipliers, wild multipliers, scatters, random progressive jackpot bonus feature. Land up to 15,000 coins with the symbol jackpot and millions of £/€/$s for hitting the magic Mega Progressive Jackpot! This is why this slot has the nickname ‘The Millionaire Maker’. It pays out million on a regular basis and has paid out more cash than any other online slot out there today. Themed Around Mega Moolah – Money in Wild Africa! Get ready for an African adventure where Lions, Elephants, Zebras, Buffalos, Giraffes and a Kudu spin the reels with high value wins paid out for connecting the dots and forming symbol combinations. For the extra features, there is a spiritual monkey that swings on the reels landing in any position in order to spark off a multiplier of the entire amount of cash you place on the spin. This is the easiest symbol to land in the game and keeps replenishing previous spins that turned up with nothing. The multipliers will pay out for as little as 2 of these monkeys landing on the reels. In addition to being a very handy way to get free cash for not much effort at all, the scatter also sparks off a lucrative free spins round that offers 15 free spins with triple multipliers. Likewise, there is a multiplier for the wild symbol completing combinations. The Lion wild symbol will double any wins it gets involved in by acting as a wild card symbol. As a final point, it is worth betting the maximum on Mega Moolah because this sparks up the chance to randomly drop in the progressive jackpot, which is the Mega Moolah wheel where you are guaranteed to win 1 of the 4 jackpots available on the wheel. Look for the ‘Spirit Monkey’ on the reels as this will spark off the chance to win multipliers of your spin bet. Land 2, 3, 4 or 5 scatters that can be anywhere in view on the reels, and you will win 2x, 3x, 20x and 100x your spin bet respectively. Remember that as with most Microgaming slots, the scatter symbol is not restricted to any paylines and the combination does not have to begin on reel 1. The symbols can be literally anywhere to count as a win. Should the ‘Spirit Monkey’ land 3, 4 or 5 times on the reels, then this will give you entry into a free spins round with 15 free spins. During the free spins round, any combinations you land will be multiplied by 3 times the value. You can also have free spins retrigger during the round by landing the scatter in the same fashion with 3, 4 or 5 anywhere on the reels. What’s more is that there is no limit to the number retriggers meaning you can land an infinite amount of free spins in any free session. For the symbol jackpot the Wild ‘Lion’ symbol lined up 5 times across the reels will pay out up to 10,000 coins. The ‘Lion’ also doubles up as a wild symbol. It can land into any combination and count as one of those symbols because it is Mega Moolah’s wildcard symbol. When the wild does get involved in symbol combinations, then you will be rewarded with extra multipliers, which is double the value of the combination displayed in the pay table. 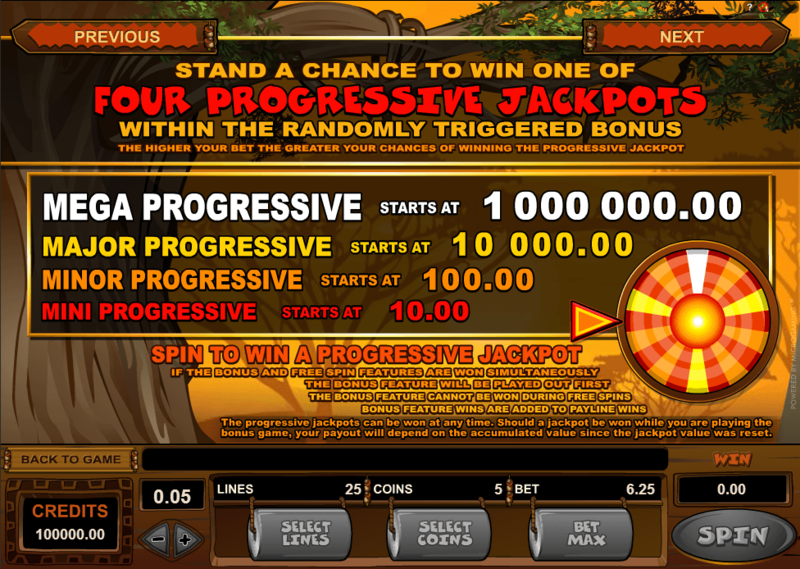 To land the progressive jackpot bonus wheel, you really don’t need to do anything because it drops in at random. There is just one stipulation though – to qualify for the random bonus wheel to activate, you need to wager a minimum of $6.25 per spin, which is 125 coins bet at $0.05 per coin. 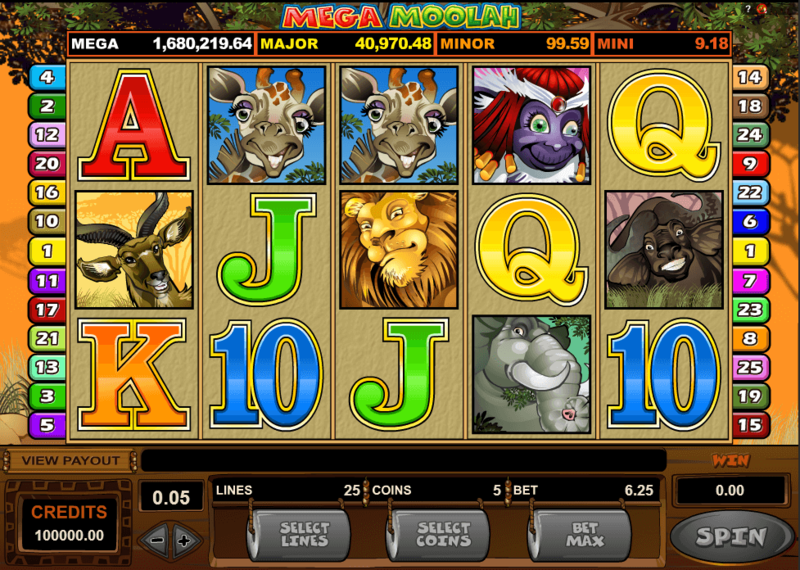 The minimum bet to qualify for the jackpot is always the maximum number of coins available on the Mega Moolah slot. At minimum you are required to wager a minimum of 25 coins, which equates to 1 coin on very line available on the slot. You can increase this up to 5 coins per line, but this has to be in multiples of 25 coins. For examples see the list below. As a result of this the minimum bet is 25 coins per spin and the maximum is 125 coins per spin. Each coin you use will need a cash value set. This is a minimum of £/€/$0.01 and a maximum of £/€/$0.05 per bet. With the minimum bet of 25 coins, you can set the coins at £/€/$0.01 for a minimum cash bet of £/€/$0.25 per spins. For the maximum cash bet, wager each coin at £/€/$0.05 and lay out 125 coins for a £/€/$6.25 per spin bet. Apart from the scatter symbol, all other combinations need to line up starting from reel 1 and move across adjacent reels to count as a win. For instance, a 3 of a kind will have the first symbol on reel 1, the second on reel 2 and the third symbol on reel 3. There can be no gaps in between any of the symbols. Therefore, if the symbols line up on reel 1, reel 2 and reel 4, then this does not count as a winning combination because the symbols do not run across adjacent reels. How Many Versions Does Mega Moolah Have? All the Mega Moolah slots can be found in several languages. Where can I find the Mega Slot?